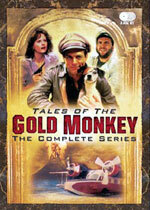 Tales of the Gold Monkey: Mystery and Suspense on Television. 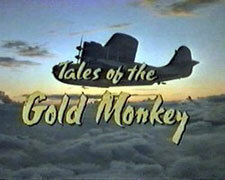 Tales of the Gold Monkey was an action adventure series that aired on ABC from September 1982 through June 1983 and included 21 episodes over just a single season. Not much mystery or suspense, but a lot of fun regardless! The series, set in 1938, starred Stephen Collins as Jake Cutter, a former Flying Tigers pilot who lives on the island of Bora Gora in the south Pacific with his one-eyed dog Jack. Other characters included Jake's mechanic Corky (Jeff MacKay), the owner of the Gold Monkey bar Bon Chance Louis (Roddy McDowall), Sarah White, an American spy posing as a nightclub singer (Caitlin O'Heaney), a German spy posing a Dutch minister (John Calvin), and Princess Kogi (Marta DuBois) who ruled over a nearby island.